Prices are dependent on the size of the function, less per person the greater number of serves, you can view the price table here. I want to book now ! What do i do ? Please provide an eft deposit of $500.00 and this will secure the booking day. be sure to email us too with your name and requested function date. Note this is non-refundable, but If the day is fully booked we will immediately return your monies in full. If you wish to change the date of booking the deposit can be applied to another date within 6 months less a $150 service charge. Eft Details are here. What is the minimum size function we cater for? ​What is the maximum size function we can cater for? The largest private function we have catered for is for 5000 serves. You call or email or fill out on Quick Quote Form and tell us about your upcoming event or party. We create a quote/menu to your specific requirements and once you have decided to proceed we request a deposit, usually 25% of the total, which secures your day of booking. Our bank details can be found here. You firstly book a specific day and time, by way of a deposit. This may be as little as one week to two years in advance. Once you have a date in mind, please be sure to book our service early to avoid us being fully booked up on that day. As the date of the function approaches we liase with you, guiding you through the menu selection, checking the site and making sure that everything will simply be perfect. On the day we usually arrive at least one hour before the serving time (great for surprises) however for a small fee we can pre-set the wok barbecues earlier. Chefs and waiters stand behind the woks and 'put on a show' throwing in garlic, ginger, chicken fillets and bok choy. With a flash of flame, the oriental delights are cooked before your very eyes. We have been known to even entice the birthday boy or host out to mann the wok, using the big wok shovel! The guests are invited to come to the wok, take a noodle box or bowl, help themselves to perfectly steamed jasmine rice and condiments and then we serve your guests directly from the wok. It's modern, contemporary Asian fusion and certainly not traditional! Alternatively we can be hidden away, working diligently in the background and serve directly to the table, using our professional waiters. Either way, the Flying Wok Experience is unique, enticing and delicious. Here you will find answers to the most popular questions clients ask us. Feel free to call or email us with your specific questions. 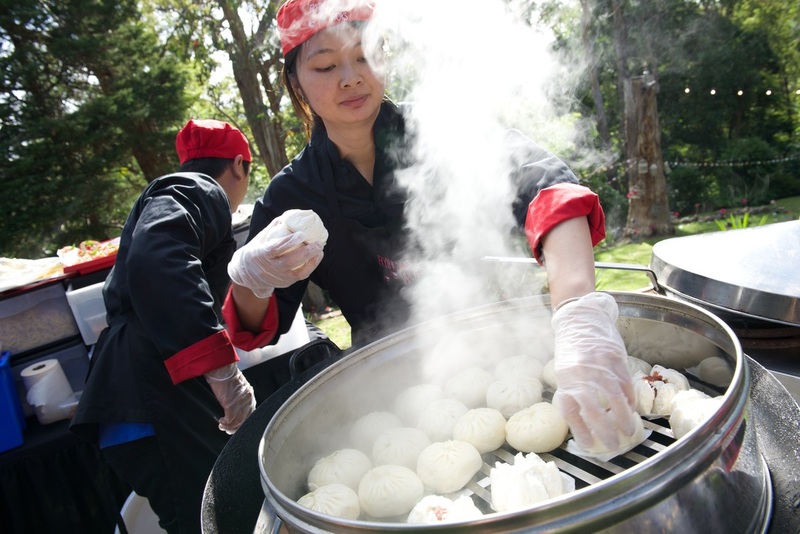 Do you travel, how far will go from Melbourne to cater? Yes we go just about anywhere. We have catered up at Swan Hill, Bendigo, near Albury, Apollo Bay, Inverloch to name a few towns way our from Melbourne. We charge $3.00 per km after the first free 30kms from Melbourne CBD. 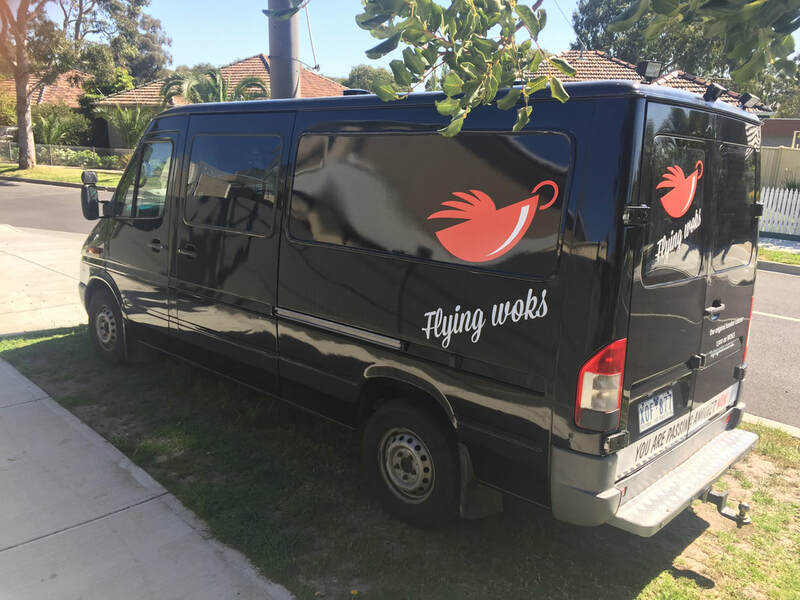 Flying Woks services all suburbs of Melbourne. When Should I Book, How Long Do I Have To Think About Whether Flying Woks Is The Right Option For Us? We take bookings on a first in, first served basis. We can cater for up to four functions on any given night, though if we accept a booking for a function for 2000 people, we will most likely cater for this event only. So the answer is once you have made up your mind to use our service, please let us know at your earliest and we will accepts a deposit usually 25% is suitable as a deposit and this will hold the day for you. We can then discuss with you at a later date serving times, menus etc. Please note you are free to change the date to a later date, up to six months if required. When Do Most People Usually Book? Wedding Bookings from one month to eighteen months. Birthday Parties usually two weeks to three months in advance. Corporate Events from one week to six months in advance. We have taken bookings with as little as three days in advance, though it all depends on availability, It is a regular occurrence in summer that we are fully booked having to unfortunately turn away bookings and at other times too throughout the year. So please to avoid disappointment, keep us informed of your intentions. Can We Taste Your Food Before Booking Or View Your Operation? No, we do not add msg and choose pastes and sauces with no msg. Whilst we do all we can to avoid MSG and do not add it, we can not guarantee no msg is in imported pastes as we do no trust labelling of products from Thailand, Indonesia & China. Before arriving, we always discuss in advance dry & wet option for wok set up up. Dry option is just about any where, wet option may be a pergolas, market umbrellas, garages, marquee, tarpaulins. Can Flying Woks provide a marquee? Yes, you can pre-book our Marquee for $150.00 though it must be booked in advance due to limited supply. 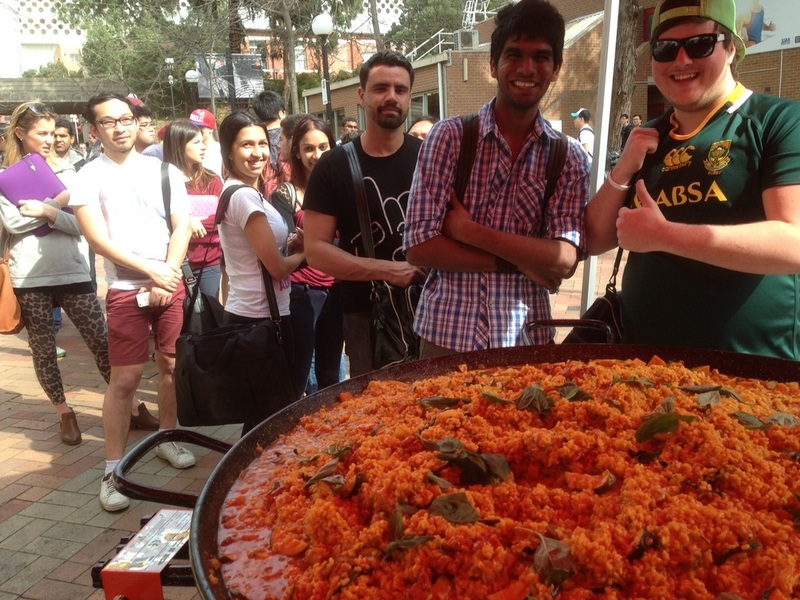 Please note it is 3 x 3metres providing just enough cover for wok staff to cook under. It is not a marquee suitable for guests. How Big A Function Can You Cater For? The largests private function so far is 5000 serves in one sitting and we have the manpower and equipment ready to cater for much more. How big is your function ? Everything to do with serving and eating the food is included in the price. 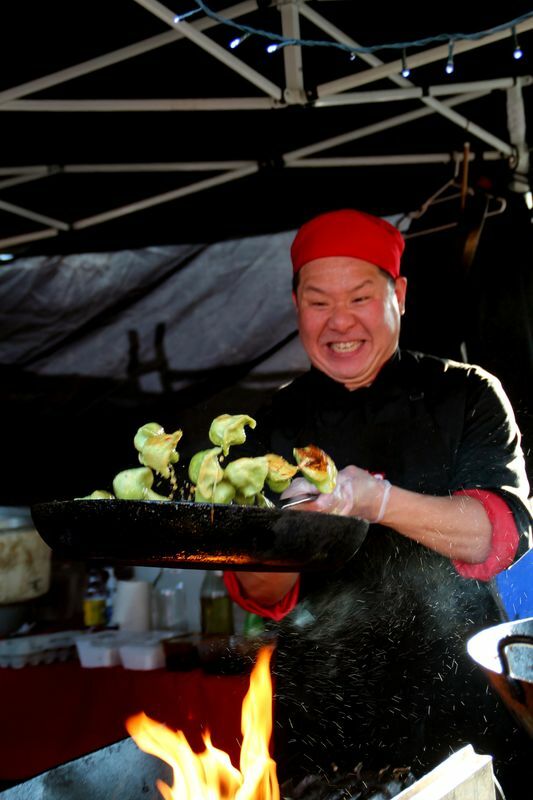 Prices include the chef and his wok waiters, food, condiments, noodleboxes, chop sticks, forks, serviettes, serving tables, spot lights, we even bring our own rubbish bins and take the rubbish away! If you required floor staff to serve courses to the table, there is an additional charge, though usually we serve the main course directly from the wok. Beverage Options are not included and there is a small travel fee if we are driving greater than thirty kilometres from Melbourne CBD. We can pre-set the wok kitchen i.e set up the woks in the morning or day before and there is a charge for this, though usually this is not necessary as we arrive approximately one to one and a half hours before the serving time. What Time Do You Serve The Food? That’s entirely up to you. We can cater seven days a week at any time. What Is A Popular Time To Serve Dinner? It varies. For example Wedding catering is usually served early evening whilst a 21t Birthday celebration we have served at 10:30 pm. It depends on the arrival time of your guests, the expectations of your guests, the time span of your event. We usually serve finger food or entrees within one hour of main courses. There is an additional time based charge when there is more than an hour between different courses. How Much Is That Additional Charge? Usually $150.00 per hour in 15 minute blocks, though it is unusual for clients to want courses spread out over a longer period of time that what is usually allocated. For a function of 50 to 150 persons we may take up about 3 x 4 metres in space. This includes space for our prep table (set up behind the chefs) the three woks (set up in front of the chefs) and a serving table (set up along side the woks) This estimate also includes space for your guests to come up to the woks and be served. Do you need trestle tables ? No we bring our own prep table (which we set up behind the wok barbecues) and serving table which we place cutlery, serviettes, rice cooker etc on. How Small An Area Can You Cook In? It depends on the number of guests too, though we have been on balcony’s in apartments on St Kilda Rd for small functions, a function for 600 guests needs potentially double the space. Generally we cook outside though have cooked inside in halls, galleries, offices and garages when there is a flow of natural air and smoke alarms are disarmed. The woks can generate a bit of sizzle, flame and smoke so when cooking inside we modify the cooking process by pre-cooking some foods. We have many times cooked outside then wheeled the barbecues in to a hall to a pre-designated space and served guests from there. That’s the best options, because we cook on show, wearing bright red jackets, tossing in food with a bit of pizzazz, we like to set up the woks in a space where your guests can see what we are doing, as well as a space that is easy for guests to come out too. Are You Flexible With Serving Times? Can I Change My Mind On The Night? Within reason. You may have agreed to have your main course served at 8:00 pm and not all your guests have arrived in time. In this case we are happy to wait 15 minutes or so, though much longer and additional charges are incurred. We try to have all these requirements like serving times, menus etc all agreed to approximately one week before hand. That gives us a chance to send you a copy of your menu and you can check in writing your self what we have agreed too. Can You Change The Menu On The Night? No. Before we arrive, we measure our ingredients specifically to your menu choices. If we are asked to make modifications whilst at the function, we will do our best to accommodate them but its best to chat with us in advance about any specific requests. How many main courses do you cook for me? We usually cook three dishes, you choice of noodles & rice based dishes. Your guests can enjoy all three dishes, either a portion of each served up to them on the bamboo plate or noodle box, or your guests can try one dish then come back to the woks and try another. Can I have more than three main courses ? How Many Entrees Can I Have? Thats entirely up to you, you can have 3 different items or 10 choices, we don't mind as long as the minimum spend is at least $500.00 for Entrees. What About Coeliacs, Vegetarians And Any Other Dietary Requirements? Sure, Flying Woks can "work" with you to create a menu that suits all your guests dietary requirements. We have catered for vegetarians, coeliacs, vegans, fod map, gluten free, fructose free and we can provide menus that are Kosher friendly, Hallal meats, Natural Hygiene based. How Do I know If Any Vegetarians Are Coming To My Function? We suggest on your invitations that you ask for people with specific dietary requirements to contact you. We are happy to chat with your relevant guests before the function, to ensure their dietary requirements have been accommodated. Can we set up on a balcony upstairs or roof top? Yes we can, we have a number of clients ( e.g. in 101 Collins St Melbourne) where we unload all our gear in the basement carpark, put into the lifts and take it all up to the 20th floor and cook up a feast on the clients balcony. There is an additional charge for this ($150-$300) though your event may well become spectacular ! with Flying Woks there woken' on. Can I have Organic Meat & Vegetables as an option? Yes you can, we have sourced a reputable Bio-Dynamic Meat supplier and Organic Vegetable Wholesaler and generally this option is an additional 15% charge. 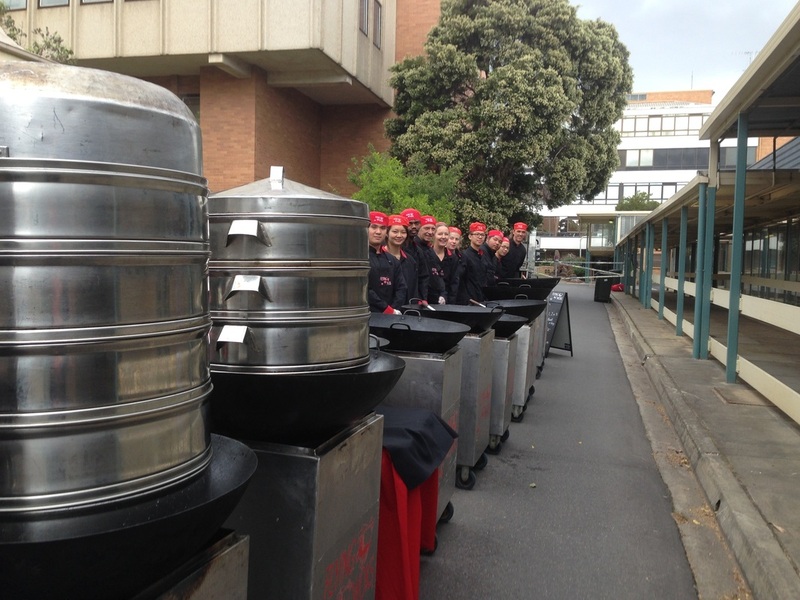 Do I need a Streatrader Certificate to have Flying Woks attend my function? No not usually. ASK US A QUESTION HERE.. Please note : we hire low height vans when setting up in basements or tighter areas.